Telangana and Andhra Pradesh Tourism: Andhra Pradesh, the third largest State in India, has many tourist destinations, including historical and natural, that enthrall and enchant the visitors to visit this place. This large state is split into two states now - Telangana and Andhra Pradesh. Geographically, it is surrounded by Indian States of Maharasthra, Chhatisgarh and Orissa in the North, Karnataka in the West, Tamil Nadu in the South, and Bay of Bengal in the East. The state was created in 1956 from the Telugu speaking portions of Madras and Hyderabad states. It is one of the first states of India formed only on the linguistic basis. During Ashoka's rule, Andhra Pradesh was a major Buddhist center. Later Chalukya kings ruled in the 7th century, followed by Chalukyas and Kakatiyas. However, in 16th century, Qutub Shahi kingdom was established and the successors were known as Nizams who ruled until 1948. This beautiful State is blessed with natural and scenic splendor in abundance as well as great culture and architecture. The State was ruled by many dynasties which influenced the culture of this land. It is one of the States in India, having rich culture and creativity. 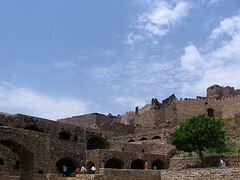 If you are planning to have a vacation here, you can visit some of the popular Andhra Pradesh Tourism destinations. with Kuntala Waterfalls, Saraswathi temple, Shivaram Wild life sanctuary, Kawal Wildlife Sanctuary, Adilabad Arts and Crafts. Nalgonda , a historic place with several temples, fort and waterfalls. In the tourism of Andhra Pradesh, the above places are worth a visit to learn more about the culture and life of the people. Silk saris, glass bangles, pearls, handicrafts, perfumes and many more. Shopping can also be done at the colorful shops of Lad Bazaar. 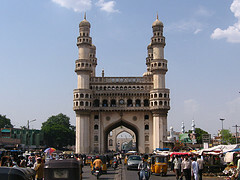 For tourism in Andhra Pradesh, Hotel accommodations are available in all the major cities of Andhra Pradesh. Andhra Pradesh has international airport at Hyderabad. By Air : Domestic Airports of Andhra Pradesh are at Hyderabad, Tirupathy, Rajahmundry, and Vijayawada. : Andhra Pradesh is well connected with rail and road transports.